Liquid loading can reduce production and shorten the lifecycle of a well costing a company millions in revenue. 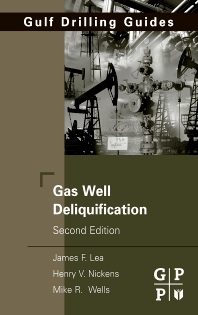 A handy guide on the latest techniques, equipment, and chemicals used in de-watering gas wells, Gas Well Deliquification, 2nd Edition continues to be the engineer’s choice for recognizing and minimizing the effects of liquid loading. The 2nd Edition serves as a guide discussing the most frequently used methods and tools used to diagnose liquid loading problems and reduce the detrimental effects of liquid loading on gas production. With new extensive chapters on Coal Bed Methane and Production this is the essential reference for operating engineers, reservoir engineers, consulting engineers and service companies who supply gas well equipment. It provides managers with a comprehensive look into the methods of successful Production Automation as well as tools for the profitable use, production and supervision of coal bed gases. James F. Lea, Jr. is currently an independent consultant for both academic and corporate facilities aiding in production projects and teaching seminars. He was previously the Chair of the petroleum engineering department of Texas Tech University, where he taught since 1999. Previous to his teaching experience, Dr. Lea worked in the industry for 20 years for Amoco as a special research associate and team leader of the optimization and production group. He taught at the University of Arkansas from 1975 to 1978, and before that he worked as a senior research engineer at the famed Sun Oil Company in Richardson, Texas. Dr. Lea holds 8 patents, has co-authored 2 books, and was awarded the SPE Lifetime Achievement Award as a "Legend of Artificial Lift". Dr. Lea earned a BSME and MSME from the University of Arkansas and a PhD from Southern Methodist University. He is a member of the Society of Petroleum Engieers and ASME.